[AUTO](VC) Limit Break 4 (This ability is active if you have four or more damage):When this unit's drive check reveals a grade 3 «Nova Grappler», until end of that battle, this unit gets "[AUTO](VC):[Counter Blast (2) & Choose two «Nova Grappler» from your hand, and discard them] At the end of the battle that this unit attacked a vanguard, you may pay the cost. If you do, choose your vanguard and one of your rear-guards, [Stand] them, and this unit gets [Power]+10000 until end of turn.". This ability cannot be used for the rest of that turn. [CONT](VC):If you have a card named "Asura Kaiser" in your soul, this unit gets [Power]+2000. 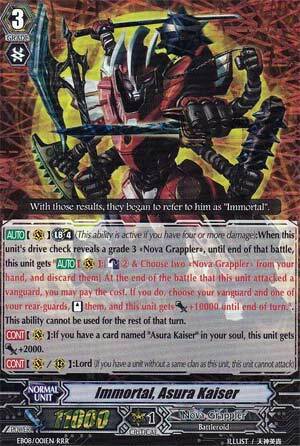 ...this one I honestly have mixed feelings about especially seeing how this is a Crossride of my first ever avatar, Asura Kaiser, which was a pretty decent card in its time. Immortal's Limit Break is what we really need to take into account seeing how most boss cards nowadays are a Crossride with the Lord clause, and this is where I'm torn. Unlike other boss cards like Tetra-drive, Chaos Breaker and others, where its stipulations are easily met by just actually doing the conditions, Immortal relies WAY too much on luck. the fact that you have to Drive Check a Grade 3 to unlock this skill is where both this and the original Asura Kaiser fall flat as it's a factor that no one can control. The average player usually plays around 7-8 Grade 3's, so if you include placing this card onto the field, then that means you're only going to pull off this Limit Break so little times not to mention that if you Drive Check two Grade 3's with Immortal, the effect will not stack, so you just lost out on another chance of pulling off the Limit Break. Also, the fact that you have to Counterblast 2 and discard 2 cards makes it so that, at best, you're only getting this effect off 2-3 times in the match. With that said, is the effect worth it? Yes. This is the first time that Nova Grapplers get an actual restanding Vanguard with its Twin Drive in check (Mr. Invincible doesn't count. Ever.). Also, the fact that it gains a 10,000 point boost makes it even harder to guard against on the second go-around not to mention that if you're a Sackboy incarnate and your Drive Check was a Trigger and a Grade 3, you still retain the effects of the Trigger when you restand (Eat your heart out, Raging Form Dragon!). Also, the fact that you're Twin Drive is still in check means that the two cards you had to discard with the Limit Break are already paid for, so there's not exactly a loss or a gain. If anything, it's a gain seeing how if you drop even one of the Grade 3's you would have in your hand from the Drive Checks, then it'll make room for more Shield for the next Drive Checks. Overall, Immortal is definitely an underlooked card for a underlooked boss. Next Time: Why have Ethics when you can just blow a lot of stuff up?! So apparently we got yesterday off due to the boss being at Denver. Possibly questionable things at Denver. But no matter. We make our late start to Champions of the Cosmos Week with Immortal Asura Kaiser. Late Game, when you Drive Check a Grade 3, after the attack’s done, just once, you can pitch 2 from the hand to stand him along with another rear-guard. Oh, and he gets 10k upon re-standing too. Does this remind you of anything? Grade 3 checker that’s restricted to Limit Break and sounds sacky on paper? Yup, it’s like Daikaiser. So of course, we improve on this guy’s odds of dropping death on our foes by abusing a reliable Ride Chain (Hello Blaus) and running A LOT more Grade 3s than we normally would. Immortal Asura falls flat without a specialised deck, like Daikaiser. However, build it this way and enjoy all that delicious power from all them columns.